Still struggling to recover from Hurricane Irma? Help is here for Florida residents of Monroe and Miami-Dade Counties. Call the IRMA helpline at 305-859-IRMA (4762). Houston, TX, October 2, 2017 – “What am I supposed to do now?” Weeks after Hurricane Harvey swept through southeastern Texas, dumping several feet of rain and flooding hundreds of thousands of homes, this is the question that remains for so many. 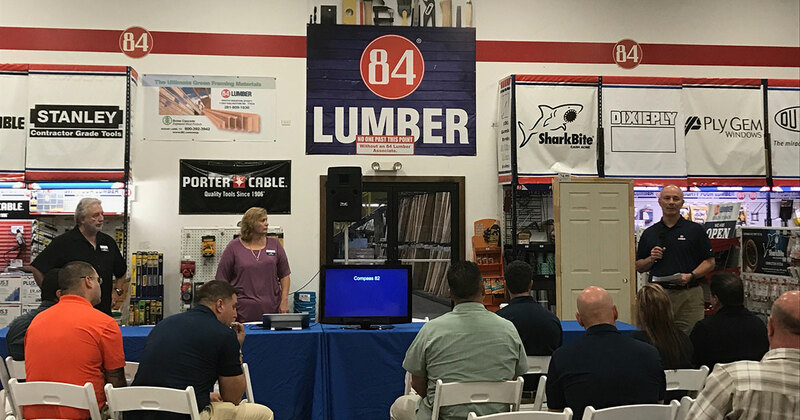 That’s why 84 Lumber has partnered with Compass 82, a non-profit organization with extensive experience in guiding relief and rebuilding efforts during the early days following a disaster. Together, the two organizations will hold several educational workshops in Houston for homeowners and contractors affected by the storm. When: Monday, October 2, 2017 from 6:30 p.m. to 8:30 p.m.
What: Learn what to expect in the months and years following Hurricane Harvey and how to engage available services. When: Tuesday, October 3, 2017 from 6:30 a.m. to 7:30 a.m.
What: Learn best practices for interacting with insurance companies and homeowners to support the rebuilding process. When: Tuesday, October 3, 2017 from 6:30 p.m. to 8:30 p.m.
Additional workshops will be announced at https://www.84lumber.com/harvey as they are confirmed. With four locations and more than 200 employees in southeastern Texas, 84 Lumber is committed to helping to rebuild Houston. Founded in 1956, 84 Lumber Company is the nation’s leading privately held supplier of building materials, manufactured components, and industry-leading services for single- and multi-family residences and commercial buildings. 84 Lumber operates more than 250 stores, component manufacturing plants, custom door shops, custom millwork shops, and engineered wood product (EWP) centers in 30 states, representing the top 130 markets in the country. 84 Lumber also offers professional residential and commercial contractors turn-key installed services for a variety of products including framing, insulation, siding, windows, roofing, decking, and drywall. A certified women’s business enterprise owned by Maggie Hardy Magerko, 84 Lumber was named as one of Forbes’ Best Midsize Employers in America in both 2016 and 2017 and Forbes’ Largest Private Companies in America 2016. For more information, please visit www.84lumber.com. With a combined 65+ years’ experience in on the ground emergency management, insurance adjustment, expedited claims facilitation, legality training, home-building, hands-on education and training, and support network programming, Compass 82 aims to be a pioneer in national disaster recovery, delivering accelerated, comprehensive and proven solutions, tools and resources that systematically bridge homeowners, insurance companies, nonprofits, and government agencies to fast-track sustainable recovery. Find out more at http://compass82.org/. If you're interested in having Compass 82 at your organization, please click here.